Meteorites and meteorite hunting are growing in popularity, especially with new awareness through television shows like Meteorite Men. Strong neodymium magnets are a great tool to have in any meteorite search. A meteorite is a piece of stone or metal that has reached the Earth's surface from outer space. 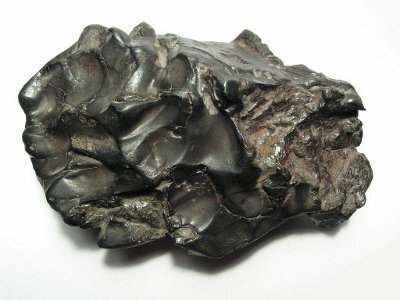 The study of meteorites involves many different branches of science, including chemistry, geology, physics and even biology. Consider the ALH84001 Martian meteorite that may show signs of early bacterial life forms. How are magnets useful in searching for meteorites? Identifying meteorites: Most meteorites contain at least some nickel and iron, while many consist almost entirely of nickel-iron. Since both nickel and iron are strongly attracted to magnets, objects can be tested quickly and easily while in the field. Visually - In many places, a meteorite will be visible as different from the surrounding terrain. Careful visual search is a great way to start searching for meteorites. In places like Antarctica or deserts, this can be very effective. 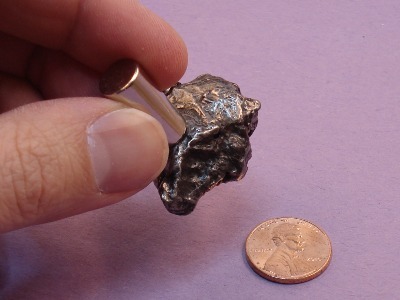 With Magnets - Many meteorite hunters like to use a strong magnet placed on the end of a stick. When searching, one can easily touch the magnet to any suspicious looking rocks to check for iron. With a Metal Detector - If a meteorite is some distance below the surface of the ground, you won't be able to pull it up with a strong magnet. The strength of a magnet's attraction drops quickly with distance. You probably won't find a meteorite that's any distance below the surface with a magnet. You can find metal detectors for under $100 or over $1,000. A discussion of how to purchase a metal detector is probably enough for a whole separate article! Even if you are using a metal detector, it's still helpful to bring a strong magnet to help identify it. For a good, basic magnet used for identifying the presence of iron and nickel, a simple cylinder is a great choice. We've used a D6C, a 3/8" diameter x 3/4" tall cylinder. It's strong, yet fairly easy to handle. Keep one of these tucked into the corner of your toolbox, where you'll find many uses for it. If you want a stronger cylinder, consider the D8X0 1/2" diameter x 1" tall cylinder. It is twice as strong as the D6C, but is still fairly easy to handle thanks to its tall height. We've also seen the guys on Meteorite Men use a big, strong disc for identifying meteorites. A 1" diameter disc like our DX08 or DX08B-N52 should be more than strong enough to use this way. Many meteorite hunters like to attach a strong magnet to the end of a walking stick. Use an old golf club, which is light and easily carried. Our Countersunk Magnets are a good choice for this, or any other place where you want to attach the magnet with a simple screw. Even better, we recommend using some of our strong Mounting Magnets for your walking stick. They are strong, powerful and more durable than a plain magnet. They consist of a disc or ring magnet encased in a steel cup, which helps make them magnetically stronger than a magnet alone. The steel cup also protects the brittle neodymium magnet from sharp impacts, so you can expect it to last longer getting banged up in the field. Any of the magnets listed below is a great choice for this, and allows easy attachment with a single, flat-head screw. Consider covering the end of the magnet with a piece of tape before dragging it across the ground. This will help protect the magnet from scratches, and ensure it lasts for many years of meteorite hunting. We've been corrected a few times using the wrong name for meteorites. What you call these objects depends on where it is. Here are three quick definitions to help get the terminology correct. A meteoroid is: a small body traveling through space, smaller than an asteroid. A meteor is: a meteoroid that has entered the Earth's atmosphere. It is typically heated to luminosity, showing a visible streak in the sky. 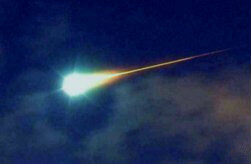 A meteorite is: a mass of stone or metal that as reached the Earth's surface from outer space; a fallen meteoroid. There are many great websites that describe how to identify a meteorite. One of our favorite summaries is the How to Identify a Meteorite page from the University of New Mexico. The desert is a great place to find meteorites, since they can sit for years without corroding in such dry weather! The site also includes some pictures to help tell meteorites from so-called meteor-wrongs. Iron-Nickel Metal and Magnetism: Nearly all meteorites contain iron and nickel. This metal is ferromagnetic and is strongly attracted to magnets. While not all pieces of magnetic rock are asteroids (you can find human-made chunks of iron), most meteorites do have some nickel-iron in them. Regmaglypts: The surface of a meteorite often has shallow depressions or cavities resembling thumbprints in wet clay or Play-Doh. Density: Meteorites, especially iron ones, are much more dense than most rocks you'll find. The link above describes how to measure the density of a suspected meteorite. We've found that meteorites can be so heavy that it's fairly obvious when handled. Just imagine how heavy a rock of that size should feel, then pick it up. A meteorite is more dense and will weigh more for a given size.